Situated in the centre of Hugh Town on the Isles of Scilly we offer the top floor of our home to be let on a 'Short Break' or weekly basis. 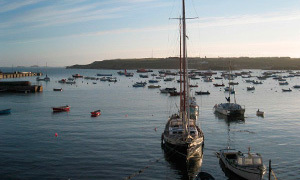 This large en-suite room, sleeping two, in a king size double and a single bed (If required), has great views of the harbour, some of the off islands and St Mary's. With Tea & Coffee making facilities, a fridge, just to chill the odd bottle, and Satellite TV you have your own self contained space with access throughout your stay. The room is rented on a bed and breakfast basis and we are close to several island Café's and Restaurants that offer a wide variety of evening meals. 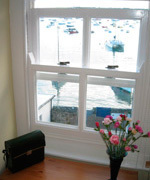 We are ideally located for 'off island' trips as well as exploring the many beautiful walks, coves and beaches of St Mary's. Our aim is to offer a homely and friendly experience and make your island holiday as relaxed, informative and memorable as we possibly can. £45 per person per night. 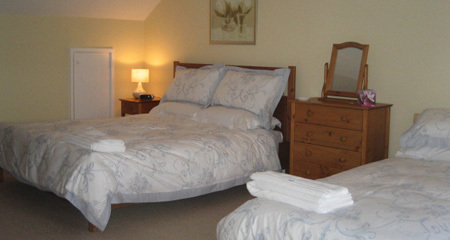 £60 per night single occupancy.